Dog Mountain is unlike any other place on earth. From the stunning mountain vistas, wildflower meadows, picturesque ponds, and miles of wooded hiking trails, there is no shortage of natural beauty. 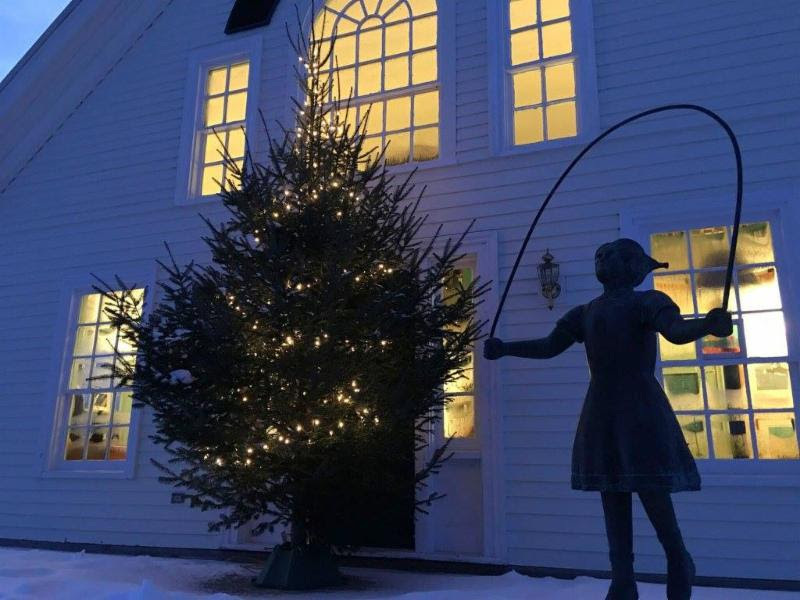 The iconic work of American folk artist, Stephen Huneck, can be found throughout the 150 acre property, turning the landscape into an interactive artist installation that's a feast for the eyes and an experience for the soul. 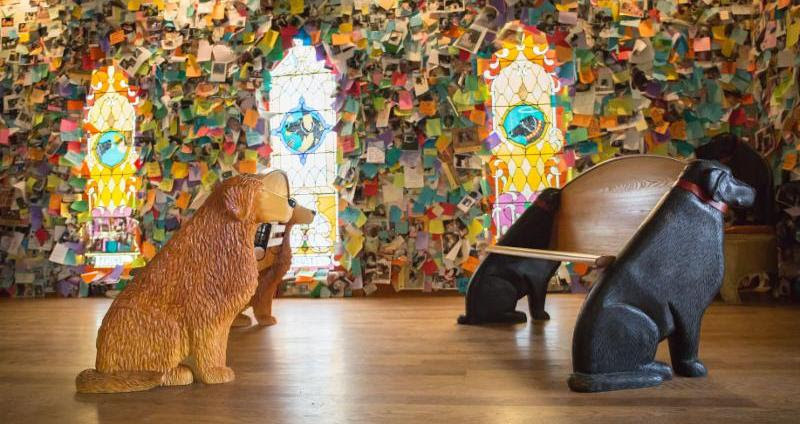 Explore the vast property and you will come across wooden sculptures of birds, benches shaped like Labradors, stone obelisks with winged angel dogs and our world famous Dog Chapel. 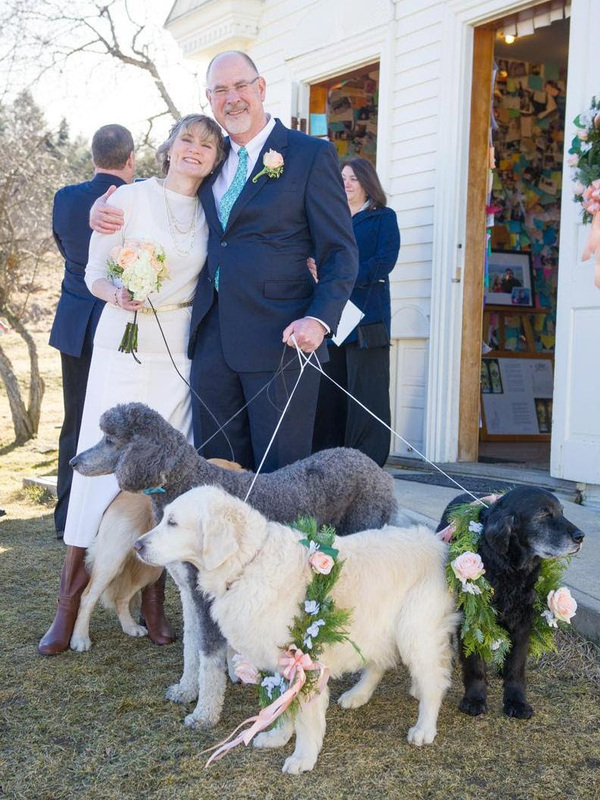 Interested in holding a wedding or event on Dog Mountain? Fill out our Event Form and the Dog Mountain Event Coordinator will be in contact shortly to answer your questions and get you started! Thank you for your support! You make Dog Mountain possible! Join us on Small Business Saturday for some Huneck Holiday fun! 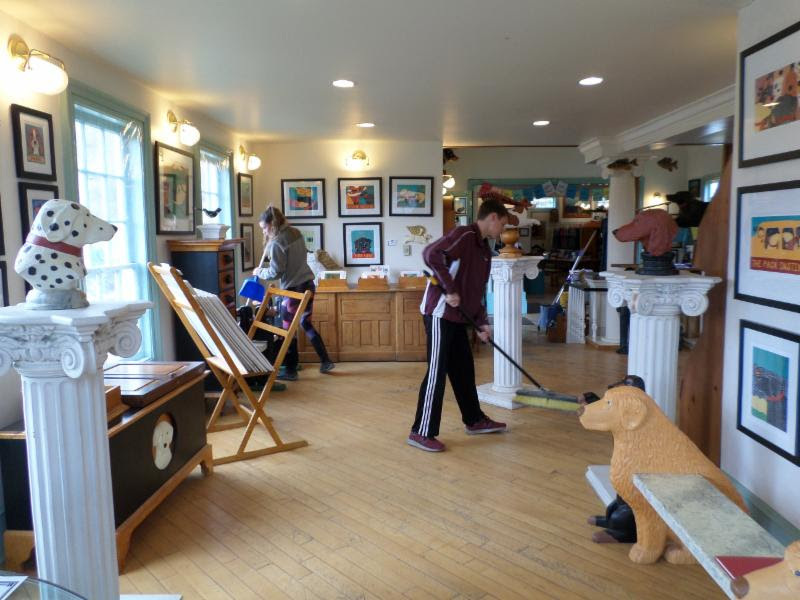 Show your support for Dog Mountain by doing your holiday shopping at Stephen Huneck Gallery. There's no better way to Deck Your Dog House for the holidays! In-store discounts on Stephen Huneck artwork and unique gifts! Delicious holiday treats for pets and people! The event is free to the public. Happy holidays! 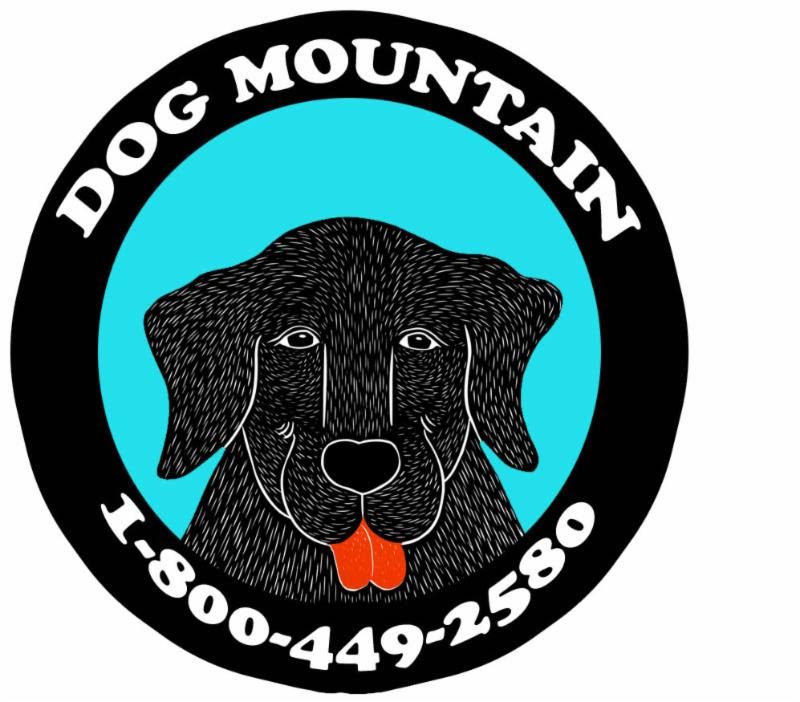 To help support future Dog Parties on Dog Mountain please consider making a tax-deductible donation to Dog Mountain. Help Bring Free Music to Dog Mountain in 2019! 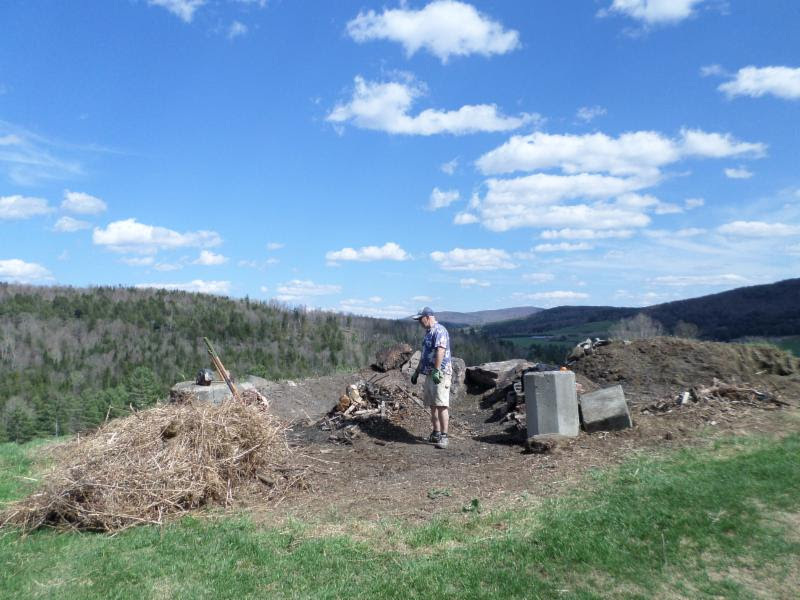 Thanks to your votes, in 2017 and 2018, Catamount Arts of St. Johnsbury won a matching $25,000 Levitt AMP grant to bring free, outdoor concerts to Dog Mountain. And, every Sunday this summer, an average of 900 people came to Dog Mountain to attend a free concert! Folks came from all over New England and beyond. 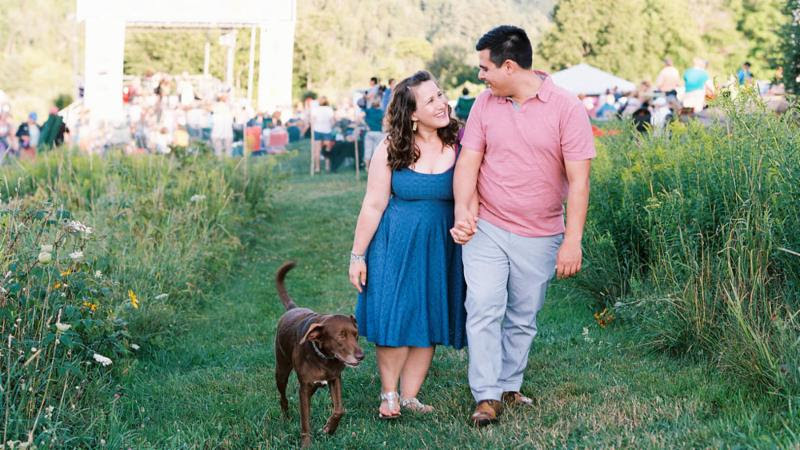 People and dogs alike roamed the grounds, enjoyed free music, breathtaking views, as well as local food and beer. Well, it's time to do it again! It's our great pleasure to announce that Catamount Arts has secured us a nomination in the 2019 Levitt AMP Music Series Grant voting round. Please register and vote for St. Johnsbury, VT. If you voted last year, you will need to log in to your account to vote again this year. Online voting ends​​ November 20th. Let's bring live music to Dog Mountain in 2019! View photos from previous Summer Concerts on Dog Mountain Here. 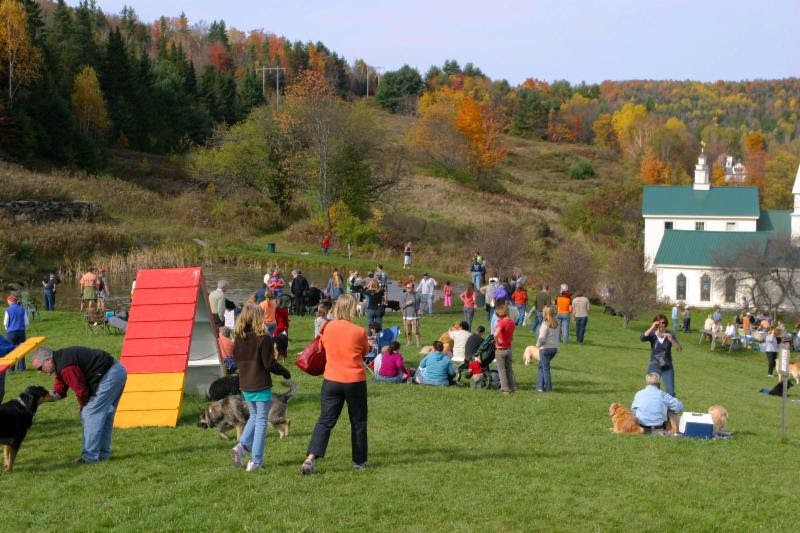 It’s the most beautiful time of the year in New England, and it’s time once again to celebrate the season at Dog Mountain’s annual Fall Dog Party! Lawn Games, Bubble Machine, & More! View photos from previous Dog Parties Here. If there was ever a day for the dog, this is it! The dog days of summer have arrived and what better way to beat the heat than to bring Fido to our annual Dog Mountain Summer Dog Party! Four-legged friends and their two legged companions will gather for a romping good time. The dogs that attend are deliriously joyful, and their joy is contagious! The Summer Dog Party is free to the public and will be held rain or shine. Catamount Arts has released the long-awaited lineup for this summer’s free live music series at Dog Mountain. 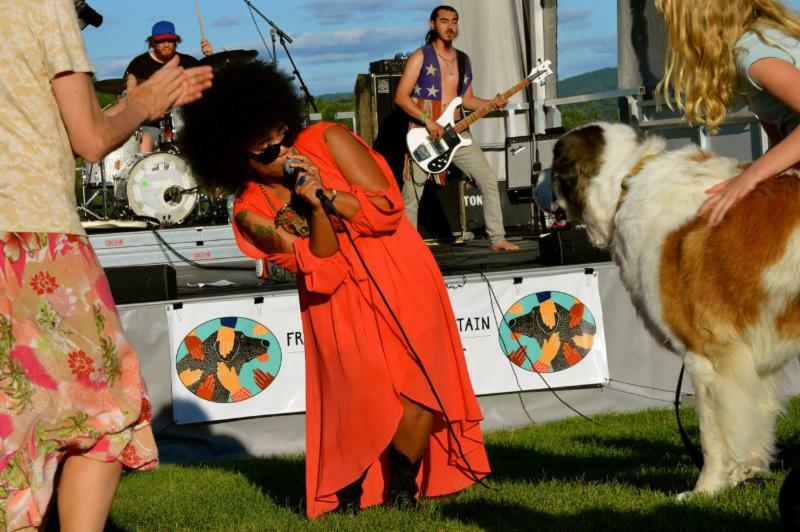 The Levitt AMP St. Johnsbury Music Series will take place at Dog Mountain on Sunday evenings from July 1st through September 9th, and will feature a diverse lineup of musicians from all over the country. *Please note: There will be no concert on August 19th. 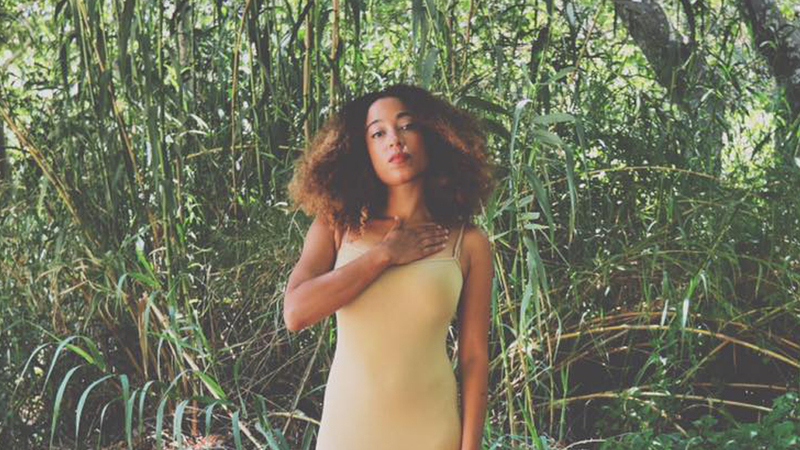 Burlington, Vt.,-based singer/songwriter Myra Flynn weaves danceable beats with emotionally nuanced lyrics that sooth the soul and draw audiences to the dancefloor like a magnet. With iridescent guitars and synths woven over undulating basslines and danceable rhythms, Flynn’s rich textured voice croons stories of self-discovery and love—both lost and found—in a sound that’s situated somewhere between Ani DiFranco and Rihanna. 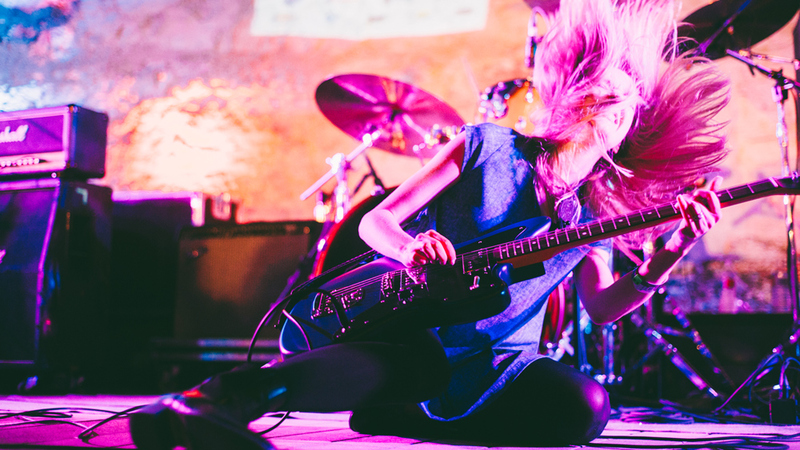 Fusing the raw passion of punk and the melodic joy of pop with explosive rock ‘n’ roll sensibilities, Ume delivers high-octane performances that bring audiences to life and leave them spellbound. 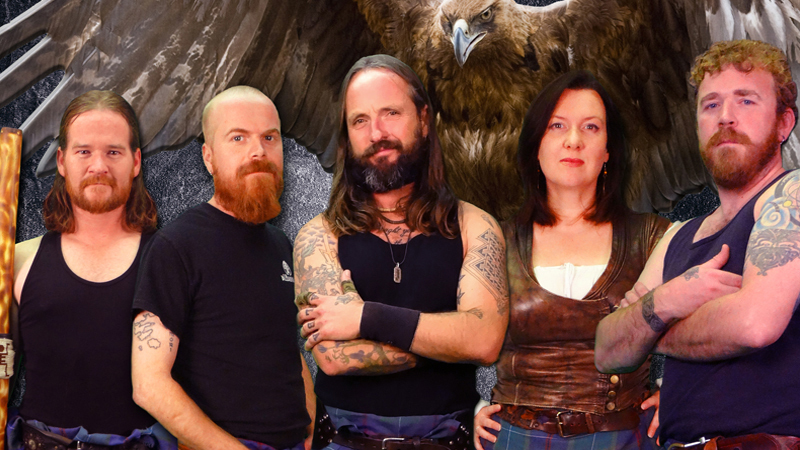 Glasgow, Scotland-based band Albannach takes a fresh new approach to pipes and drums music with charismatic reinventions of traditional tunes and original odes to their Scottish-Gaelic heritage in powerful live-performances and a sound that’s larger than life. Genre-defying seven-piece powerhouse ADAAWE creates a vibrant global fusion of R&B and pop steeped in gospel harmonies over jazz, funk and African stylings and lively Latin and reggae that will lift your spirits and get you dancing. 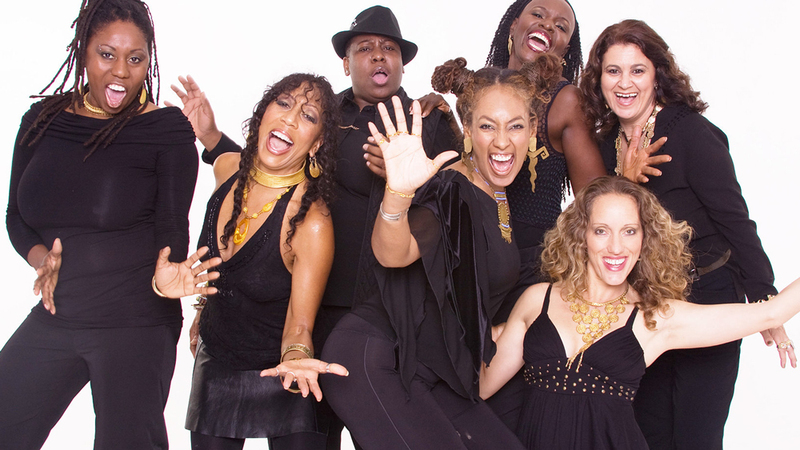 Comprised of seven female all-star musicians, the group’s exhilarating djembe drumming and uplifting lyrics celebrate strength and love while drawing audiences to the dance floor and closer together in the ‘Adaawe’ tradition of Ghana, West Africa. 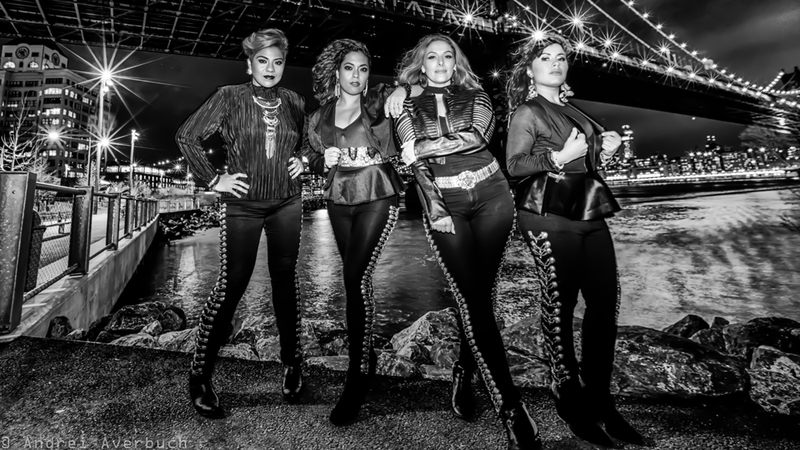 New York City’s first and only all-female mariachi­ group, GRAMMY Award-winning ensemble Flor de Toloache, is pushing genre boundaries and getting concertgoers dancing with their fresh, versatile take on traditional Mexican music. The group constructs its dynamic sonic framework with explosive vocal harmonies and searing solos rounded out by soaring violin, nimble vihuela, bright trumpets and propulsive guitarron in vibrant songs that honor the heritage of mariachi music while delivering their own unique sound. 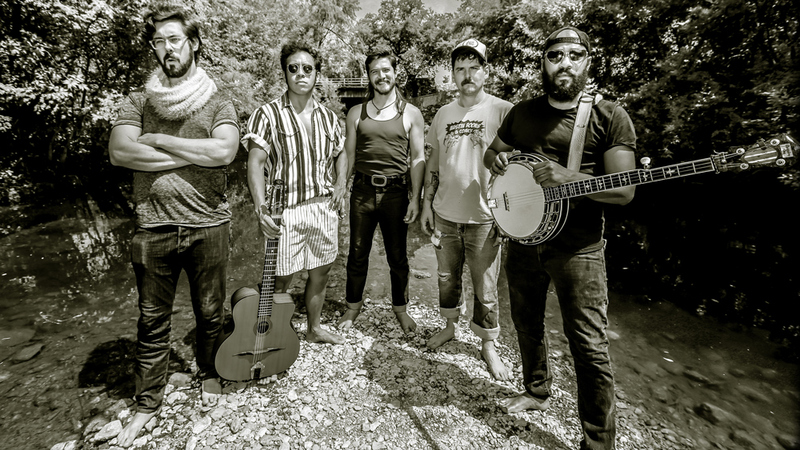 Fusing tranquil bluegrass with punk sensibilities, Whiskey Shivers is a sight to behold, bringing together a diverse group of masterful musicians in a genre-pushing sound that gets concertgoers of all ages and backgrounds dancing. Featuring frenetic banjo and guitar picking, lyrical fiddles, propulsive upright bass and a frenzied washboard, the group delivers soaring vocal harmonies in songs that explore themes of life in the country and raw emotional landscapes. 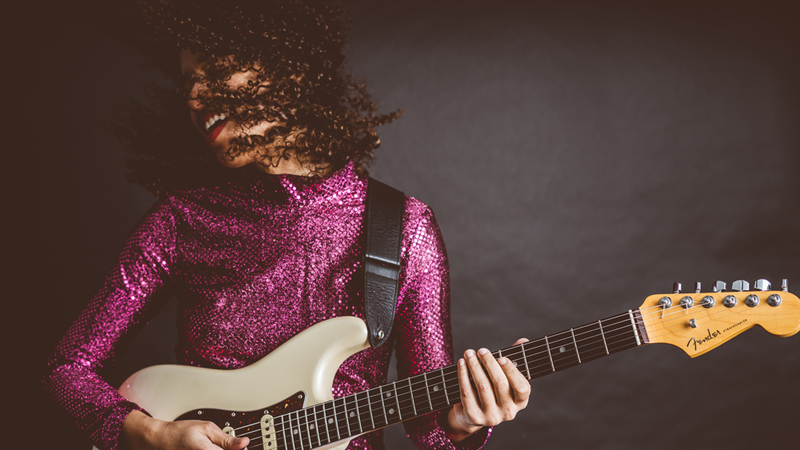 Described by the Austin American Statesman as an “astonishing mix of raw soul, superb musicianship and laid back grace,” rising blues star Jackie Venson’s electrifying live shows bring the house down and leave audiences wanting more. The 28-year-old thoughtfully blends blues, R&B, indie, soul and rock ‘n’ roll with scorching guitar riffs, precise fretwork and smooth, smoky vocals. 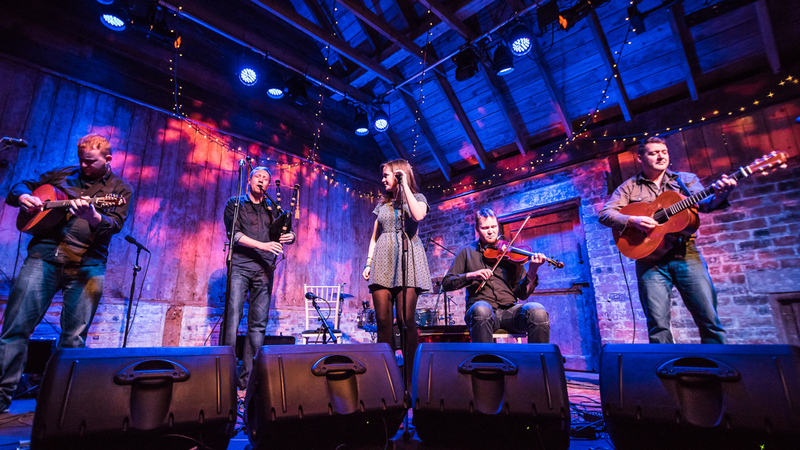 rom fiery danceable jigs to lilting poignant ballads, Dàimh has garnered a fervid following with authentic time-honored Gaelic music rendered with a modern edge and stunning musical acumen. Pronounced “dive,” Dáimh takes their name from the Scottish Gaelic word for ‘kinship’ and they use lyrical fiddles, bright pipes, rhythmic mandolin and accordion under frontwoman Ellen Macdonald’s soaring gossamer vocals sung in Gaelic to create a visceral connection with their audiences. 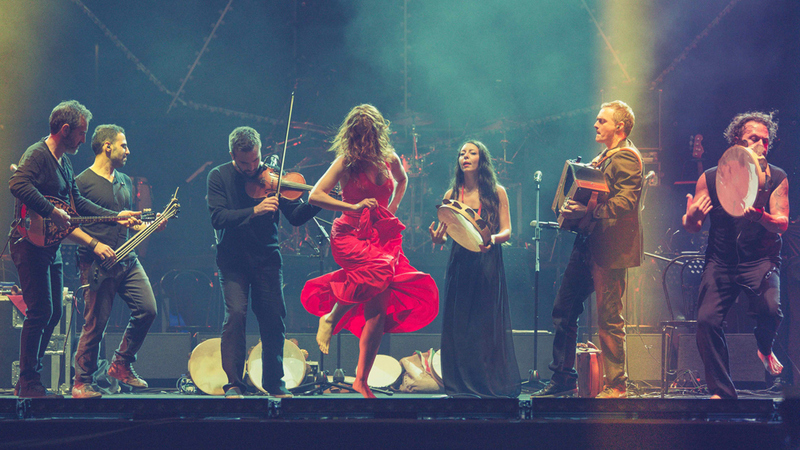 Hailing from Puglia, Italy, Canzoniere Grecanico Salentino takes on Italy’s ingrained dichotomy of tradition and modernity with explosive performances full of vibrant energy, infectious rhythm and undeniable passion. 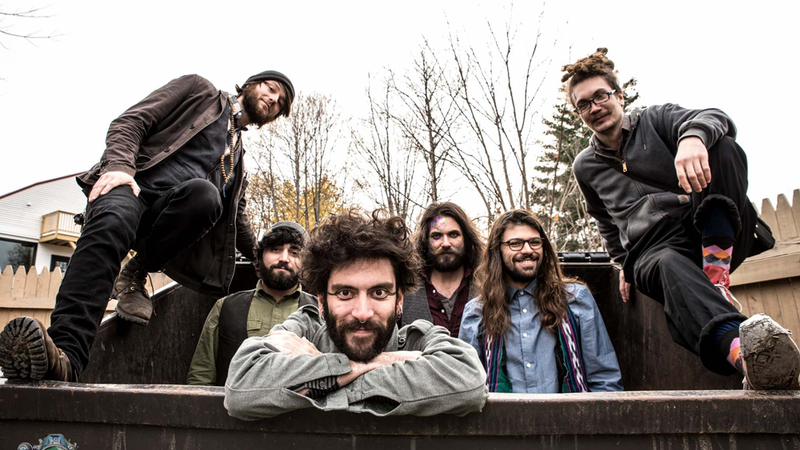 The seven-piece group creates a colorful soundscape with their rich layers of propulsive frame drums, accordion, fiddles, synthesizers, harmonica, Italian bagpipes, bright classical guitar, bouzuki and soaring vocals (complemented by a fiery dancer). 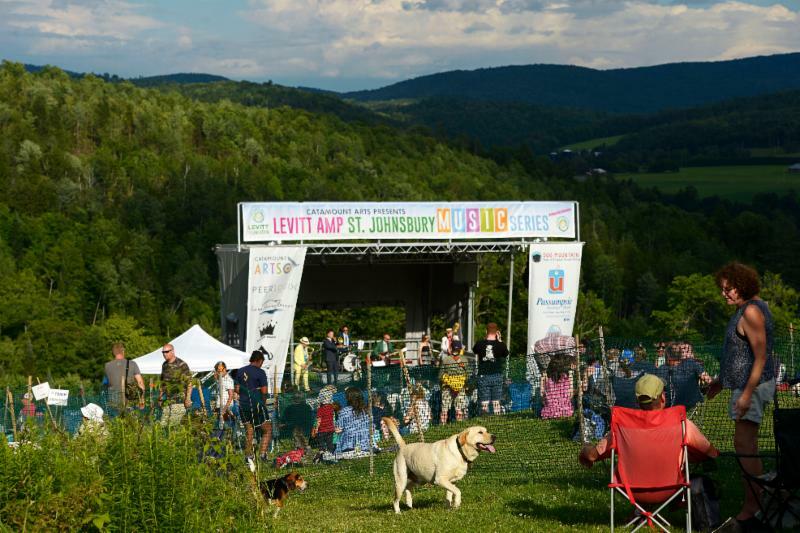 Thanks to the Mortimer and Mimi Levitt Foundation and many generous community sponsors, every concert in the 2018 Levitt AMP St. Johnsbury Music Series at Dog Mountain is FREE. The free concerts are open to all ages, and dogs are welcome. Concerts run from 4 to 7pm every Sunday evening from July 1st through September 9th. There will be a variety of food vendors and a beer tent on-site. For more information, visit concerts.Levitt AMP.org/stjohnsbury. 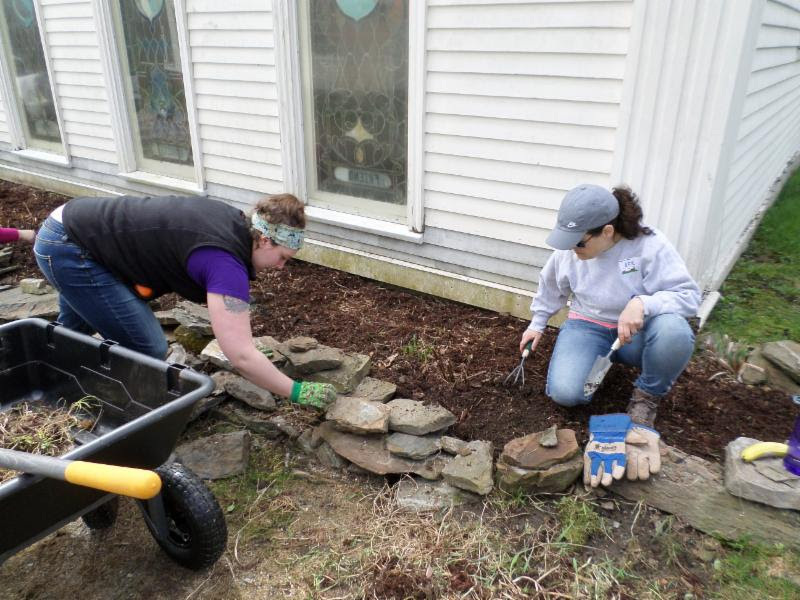 This year’s Labor of Love Event was once again all heart! 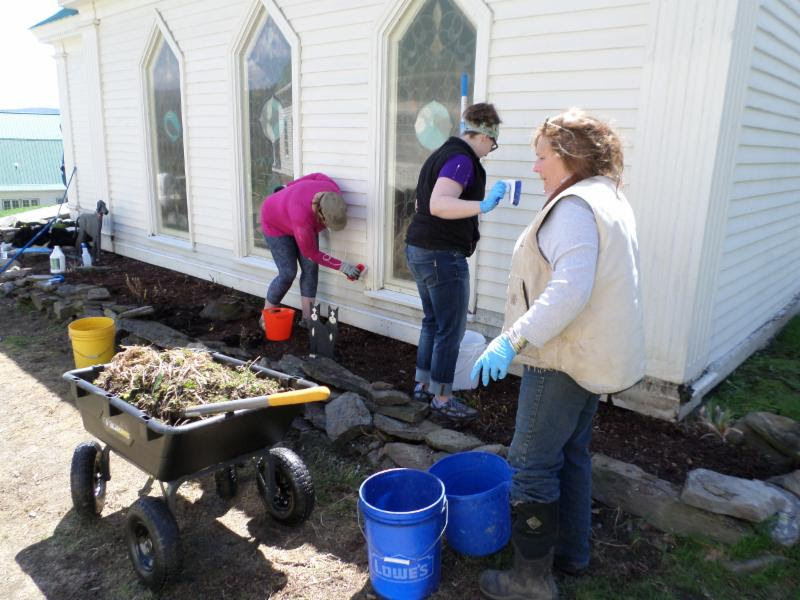 Human hands and K-9 paws teamed up last Saturday and Sunday to make the Dog Chapel and Gallery sparkle, smooth out the roadway, clean and spruce up the gardens and grounds and put some fresh white paint on fences and signs. Special thanks to Gary Lunderville for grading the driveways and parking lots. More special thanks to Susan Ohlidal for being our official greeter! 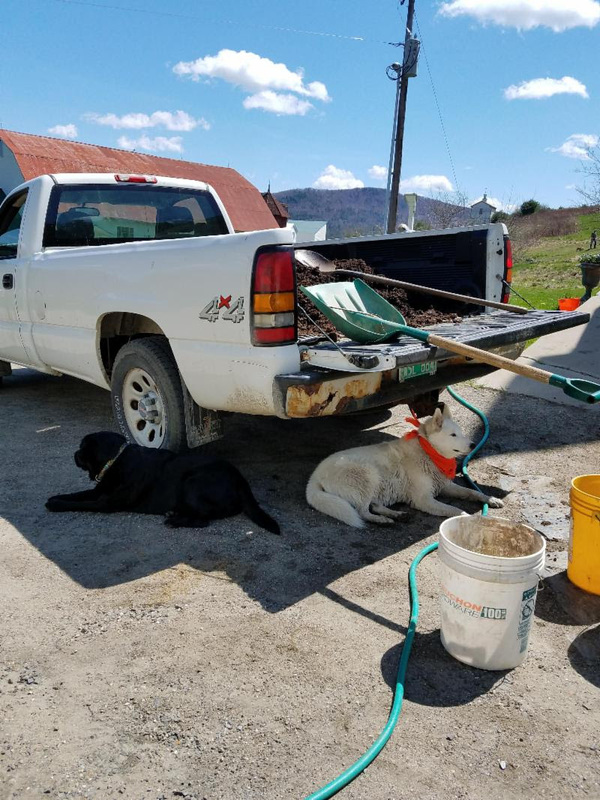 Our dogs Sally and Greer send out thankful barks and the (furless) staff here at Dog Mountain send all who attended our gratitude and appreciation! Thank you everyone for your heartwarming support of Dog Mountain! 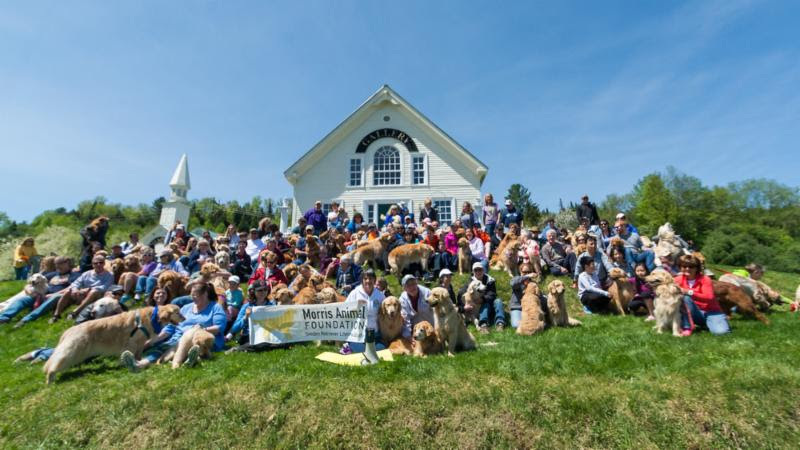 Join 150 Golden Retrievers at Dog Mounain for a Golden Good Time at the New England Golden Jubilee! The Goldens are coming to Dog Mountain! At this year's Jubilee, Golden Retrievers, Golden Retriever Heroes and Supporters of the GRLS will participate in activities that will indulge the very nature of the Golden Retriever, while embracing the presence of their soft fur, wide smiles and soulful eyes. The event kicks off at 9:30 a.m. with a Golden Romp. The welcoming ceremony begins at noon and will include a Blessing of the Animals. Joy Viola of Friends of Guisachan will provide a brief presentation marking 150 years of the Golden Retriever breed. 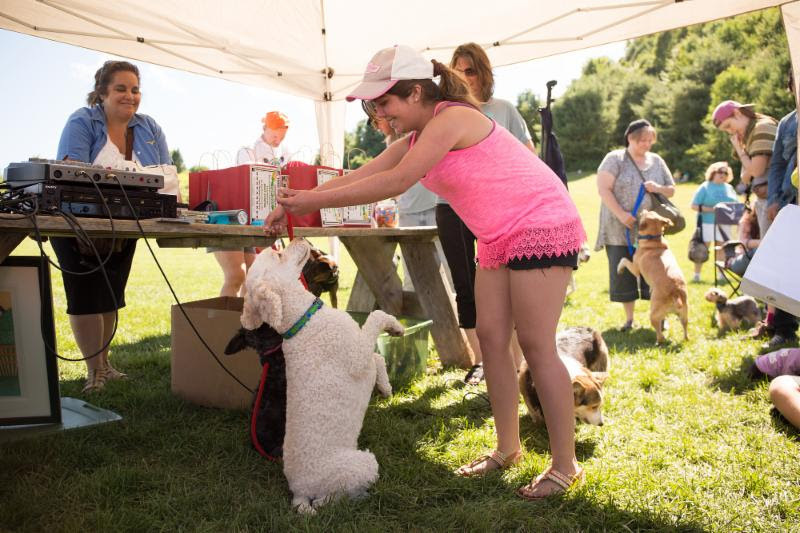 Other activities include the great tennis ball toss, a dog swim, kibble-cup auction to benefit Yankee Golden Retriever Rescue and a cookout with hot dogs and hamburgers for Golden Retrievers and their people. Adding to the fun, will be a freestyle performance by Laurie Sullivan and her Golden pack who have danced their way across television screens many times, including appearances on Animal Planet, The Rachel Ray Show, the Today Show and more. 2018 Founders Celebration Dog Party! 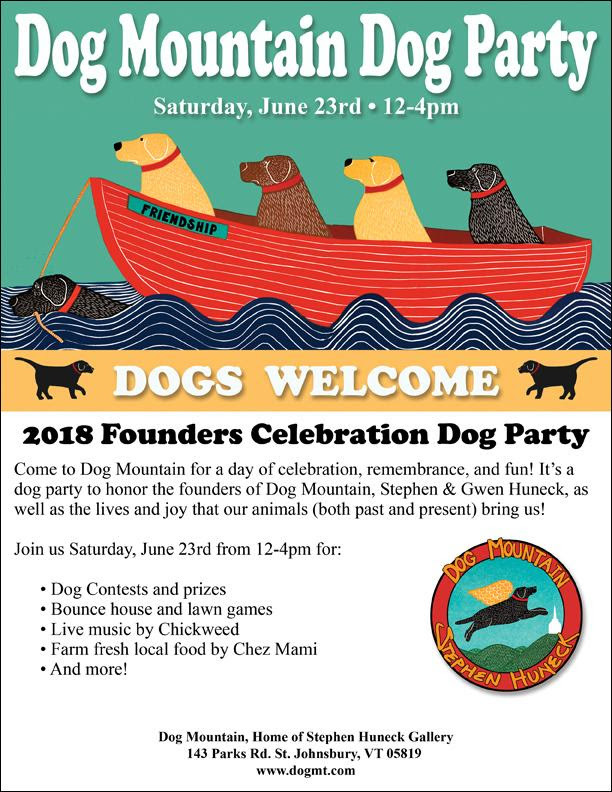 Stephen Huneck Gallery and Friends of Dog Mountain invite you to a dog party to celebrate the life and loves of Dog Mountain founders, Stephen and Gwen Huneck. Come and celebrate with us! If you have dogs, bring them. If you don’t, come anyway! 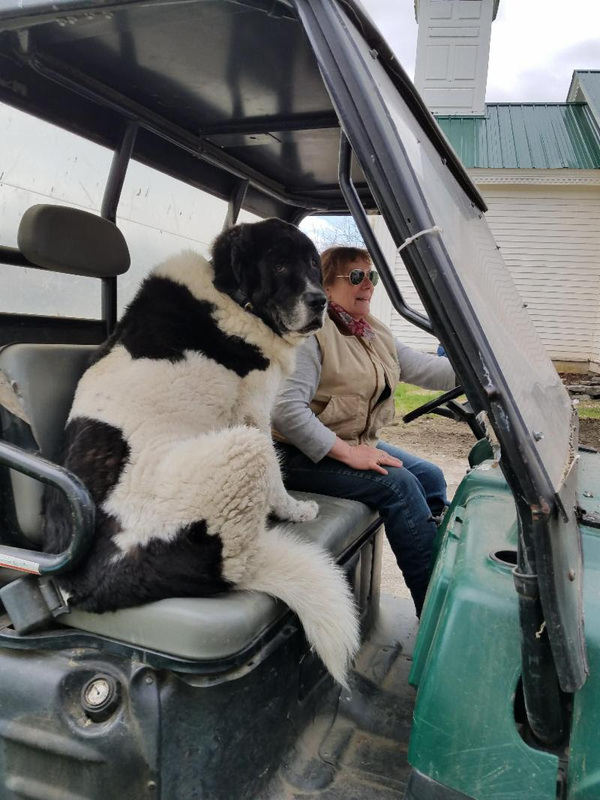 With live music by Chick Weed, delicious farm fresh local food by Chez Mami, fun-filled events, and plenty of room to run, romp, and play, visiting families and their dogs can enjoy Dog Mountain’s leash optional policy from the hills, ponds, and pastures, to the whimsical art gallery. The event is free to the public and will be held rain or shine. 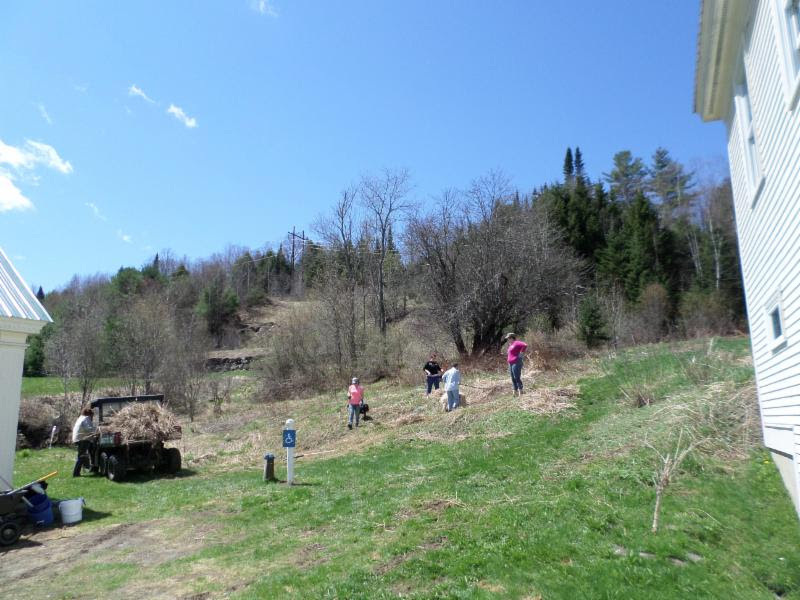 6th Annual Labor of Love Volunteer Event! Dog Mountain Needs Your Help! 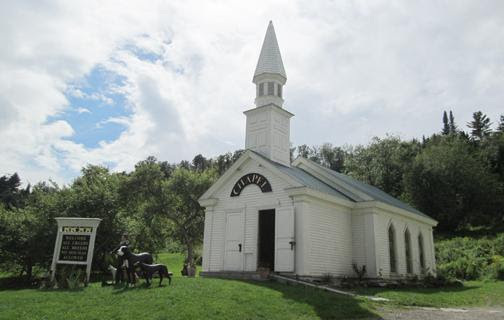 The heart and soul of Dog Mountain has always been the Dog Chapel. No other building on Dog Mountain has elicited more joy, tears, laughter, and love. 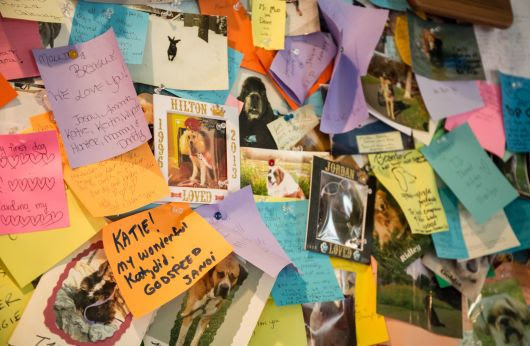 It's a place of great warmth and healing, as well as place to remember those four-footed friends who have touched us the most. 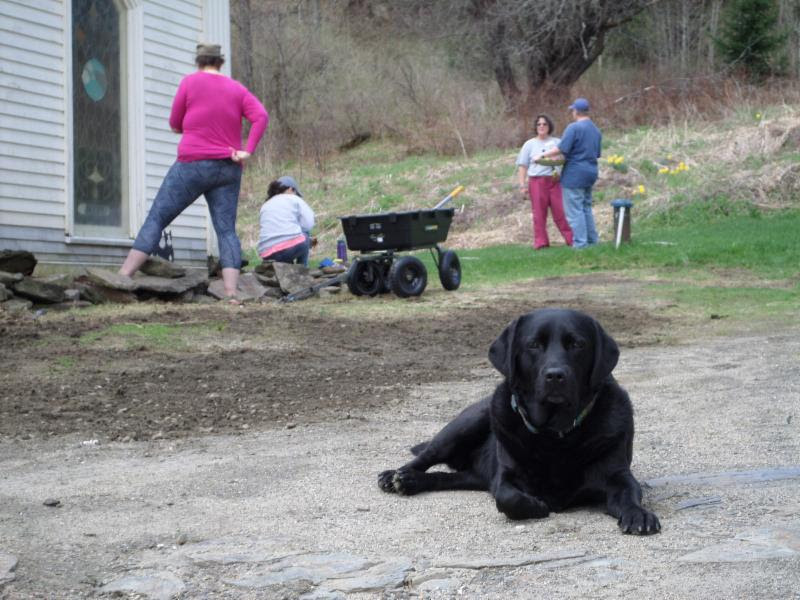 The Dog Chapel has stood strong through the years, but the years (and the Vermont winters) haven't been kind. She's in need of a little TLC. 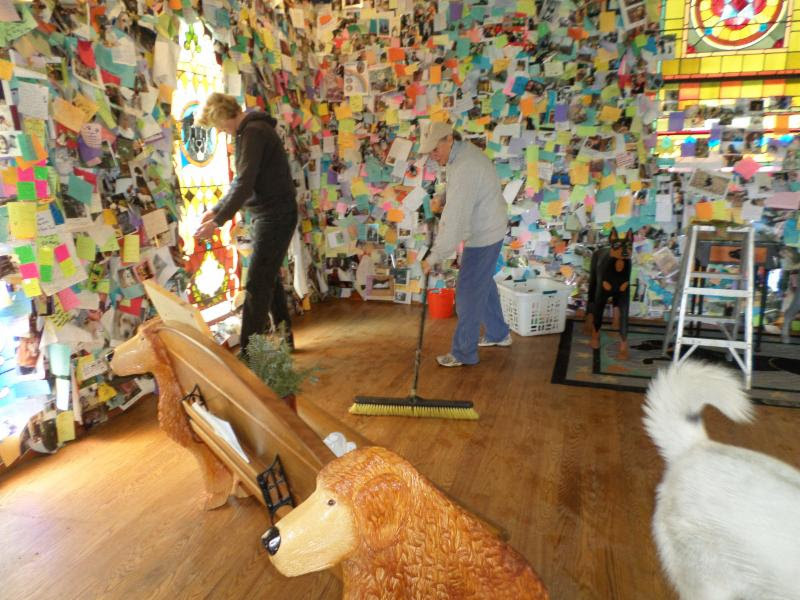 So we've got a big, heartfelt project planned for this year's Labor of Love... beautifying the Dog Chapel! WE NEED YOUR HELP! We can't do it alone! 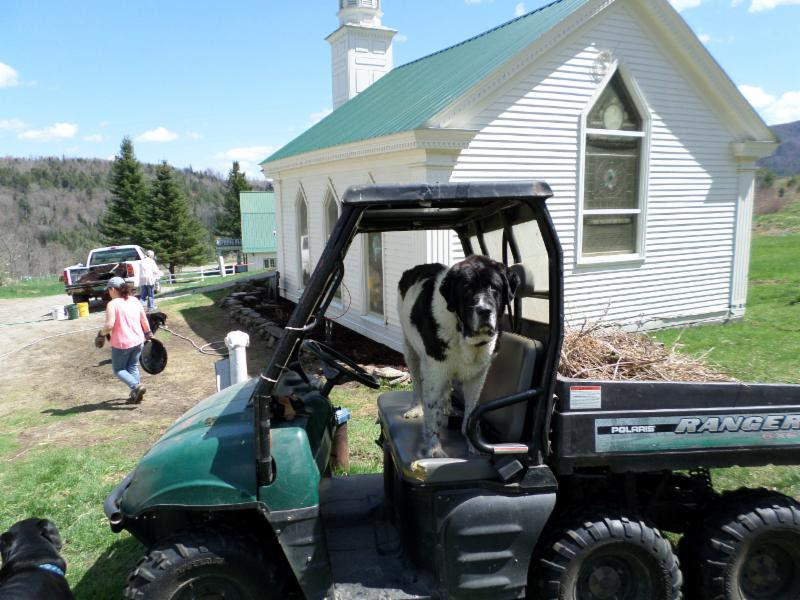 It's going to be a Labor of Love to get our beloved Chapel back in tip top shape, and we're going to need the help of the Dog Mountain Pack! 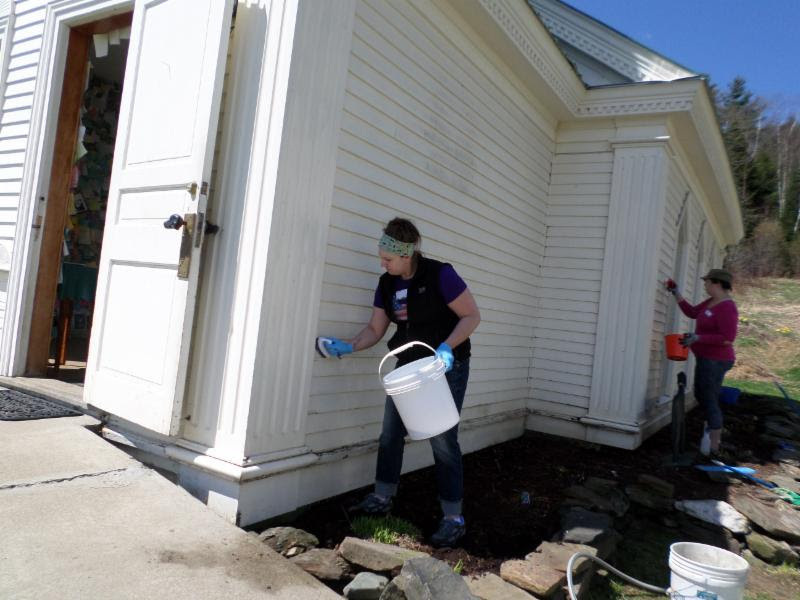 Join us May 5th & 6th to clean, rebuild, repaint, and redecorate the Dog Chapel. Sign up to volunteer and tell us a little about yourself, your interests and skills. Then join us for a few hours, or the whole weekend! Whatever you can give! Lunch will be provided to all volunteers. Can't make it to the event but still want to help out? Please consider donating to the cause! Thanks to your incredible support, we know this year will be the best Labor of Love yet! Dog Mountain Forever!